Getting up before 5 am every day really hasn’t been a problem. When you carefully take a peek through the little breathing hole in your sleeping bag it is a relief to see the light of dawn because it can only mean that the temperature will rise. The – 30° C rating on the Northfake sleeping bag can only have been sewed on by a cruel jester. Who really takes the sting out of the brisk mornings is our hearty cook Sonam, as he has been handing in two cups of steaming hot coffee into the tent. 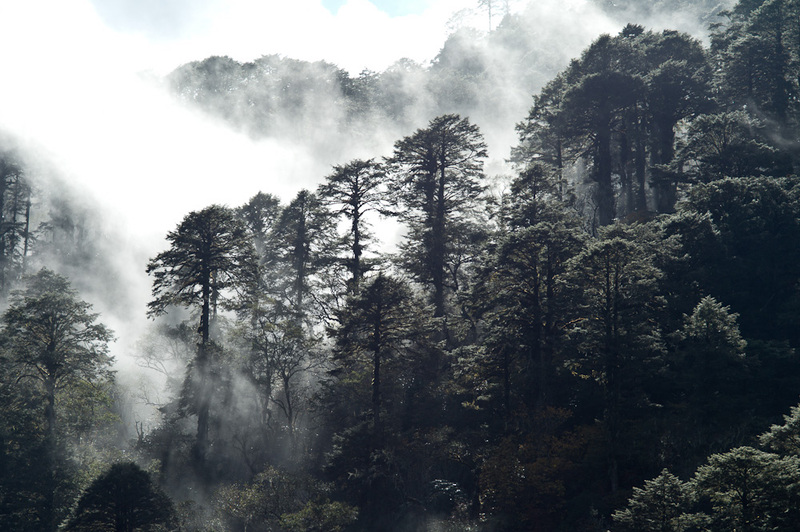 This entry was posted in Uncategorized and tagged Bhutan, Bumthang, trek on October 31, 2010 by cranky. The self-declared keeper of the Dur Tsachu hot springs now lives on the west side of river. Sangay Tenzin was sent here on a military expedition by a prior King some 25 years ago or was it 40? The 67 year old remembers the unsuccessful expeditions to Gangkhar Puensum well. He accompanied the climbers with his yaks and has held his post as a hermit at the hot springs since. He moved to the Wangdi side of the river a couple of years ago because his Bumthang native neighbors thought his yaks were damaging the springs. These days the best preserved hot tubs are right by his hut at the river and he will show you with a wry smile how to disrobe and make proper use of them. 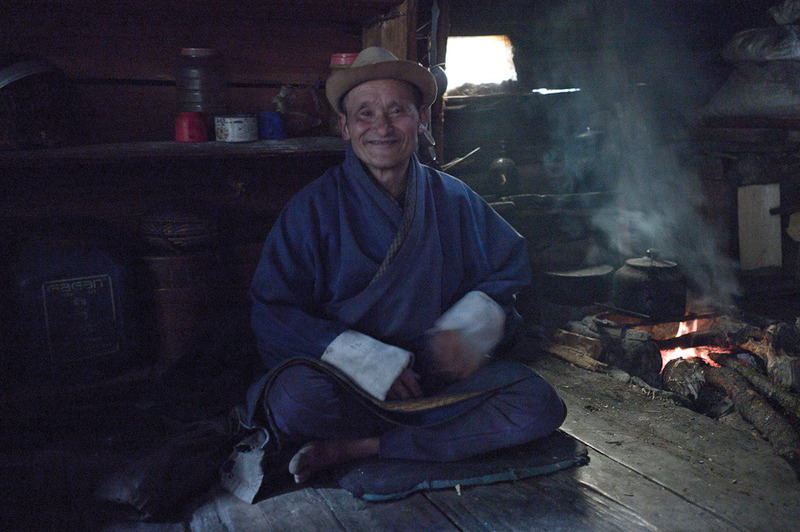 He tells his story over a kindly prepared cup of what was to be Katja’s first and last yak butter tea. 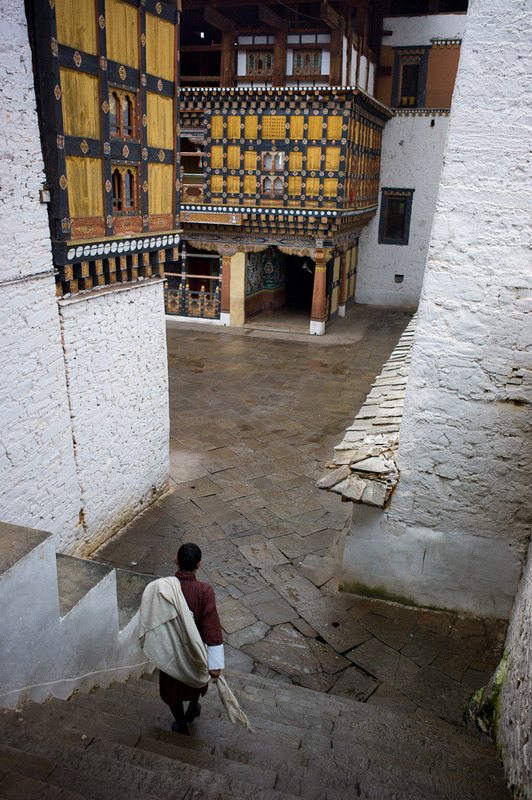 This entry was posted in Uncategorized and tagged Bhutan, Bumthang, Wangdi on October 29, 2010 by cranky. We really haven’t found any decent maps for the region. The altitude of mountains varies by 500 meters depending on which map you look at. Word is that there are some decent Russian topographical maps out there but we have yet to see them. If only the Federal Office of Topography swisstopo would donate their time. They could even use the same grid as the countries are roughly the same size and the terrain has the same complexity. 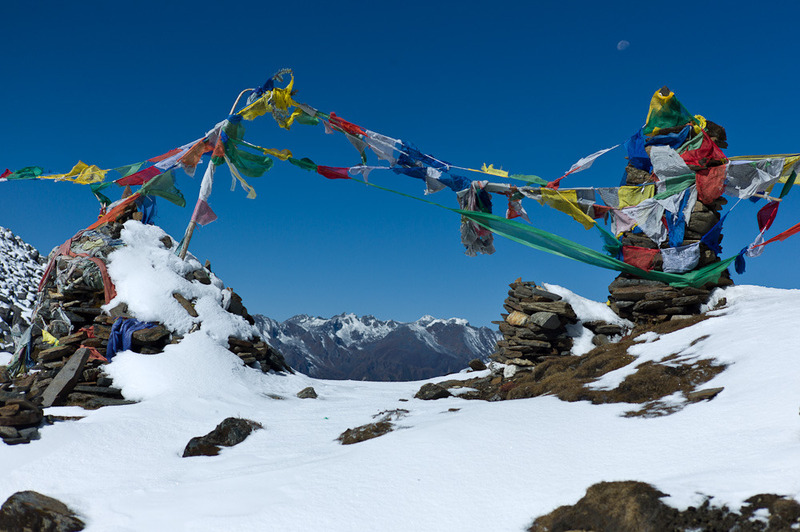 This entry was posted in Uncategorized and tagged Bhutan, Bumthang, trek on October 29, 2010 by cranky. As the horseman Tenzin lights a fire, Cranky gets his hope up for thawing his feet at their campsite at 3870 meters. The air temperature measures – 4°C but feels much colder due to a light breeze blowing from the glacier above. 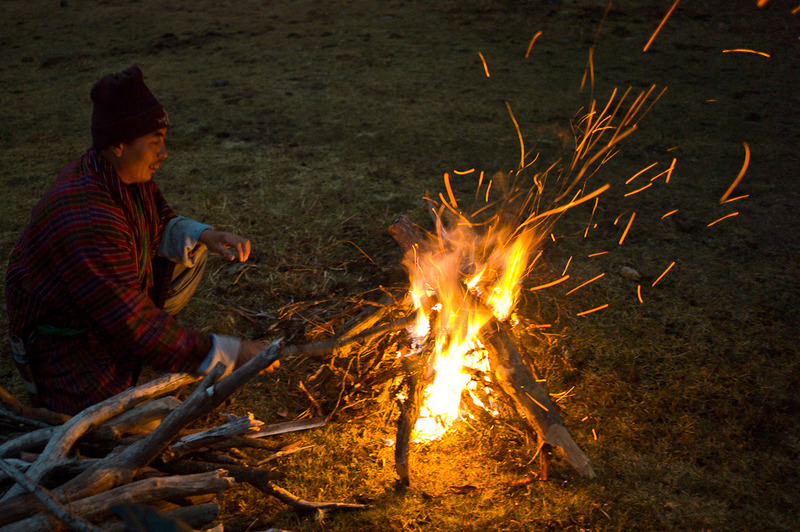 This entry was posted in Uncategorized and tagged Bhutan, Bumthang, fire, trek on October 28, 2010 by cranky. The morning brings the smell of fire and sight of smoke in the valley. A smoldering gap the size of a city block opens where the stores were where we had bought trekking provisions just last night. The town’s only fire engine was overwhelmed by the flames right in the heart of town. Dreary residents stumble around after a night of trying to rescue what they could. Two people perished and 14 had minor injuries due to the fire. 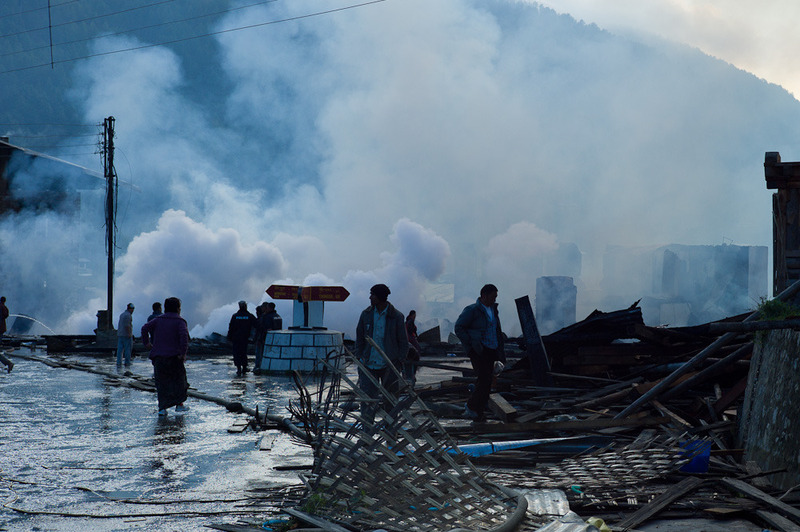 This entry was posted in Uncategorized and tagged Bhutan, Bumthang, fire on October 27, 2010 by cranky. 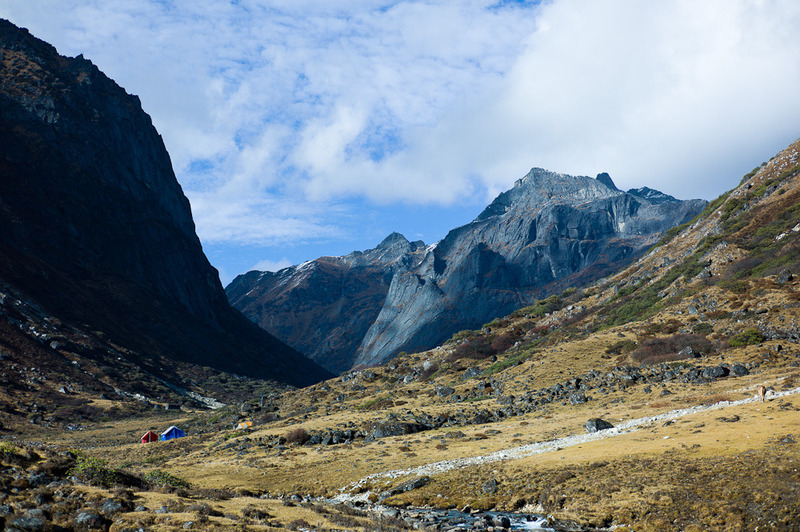 Chamkhar, our eastern most point from where we will hike north towards Gangkhar Puensum, at some 7570 meters the tallest unclimbed mountain in the world. We leave the mountain alone and look for some hot springs instead. A couple of passes above 4500 m will be plenty to tackle for us lowlanders. 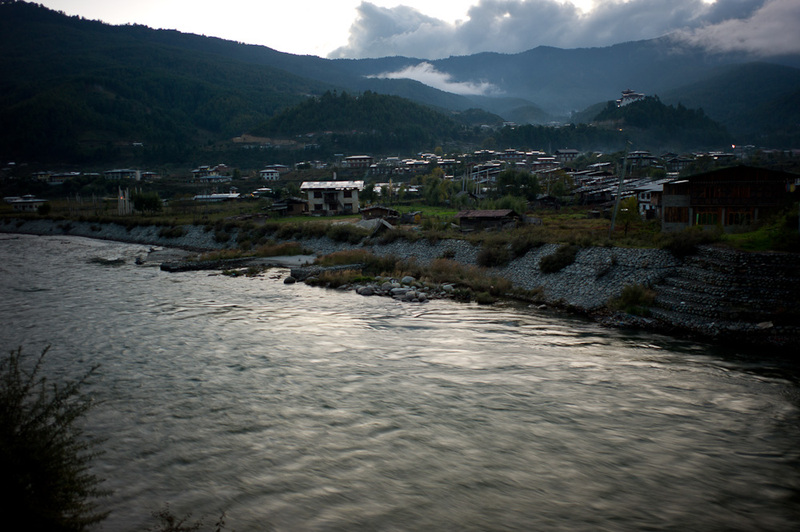 This entry was posted in Uncategorized and tagged Bhutan, Bumthang, dzong, river on October 25, 2010 by cranky. As we take a stroll down the #1 and only highway going west – east we chat with children who have mastered a perfect rendition of the Queen’s English with a slight touch of India. 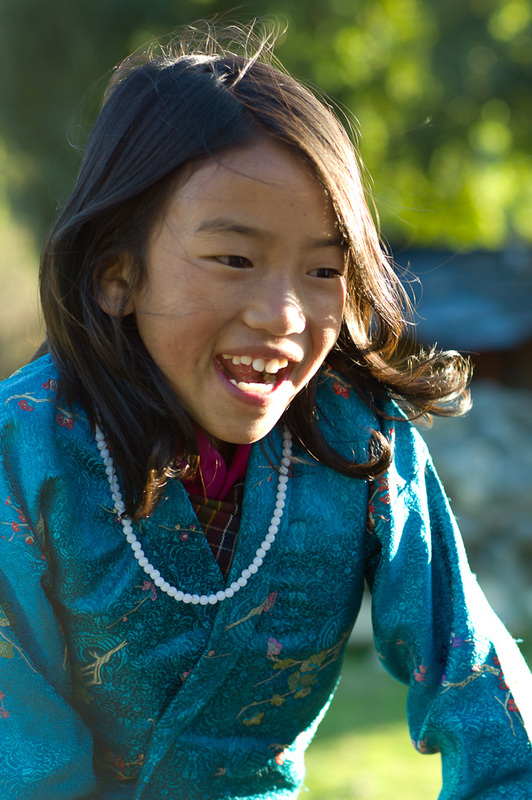 Since most school subjects are taught in English, communication with Bhutanese is a breeze for us. This entry was posted in Uncategorized and tagged Bhutan, girl, Zungney on October 24, 2010 by cranky. The old growth forests leave us bedazzled. Everywhere we look, seemingly endless slopes of trees. We can’t stop staring at the trees as if they are an apparition soon to disappear. This entry was posted in Uncategorized and tagged Bhutan, Thimpu on October 23, 2010 by cranky. If the sun doesn’t come out in full force very soon, the rice farmers’ labors of an entire season will go unrewarded. Note the red chillies drying on the roof … the food can be very, very spicy here. 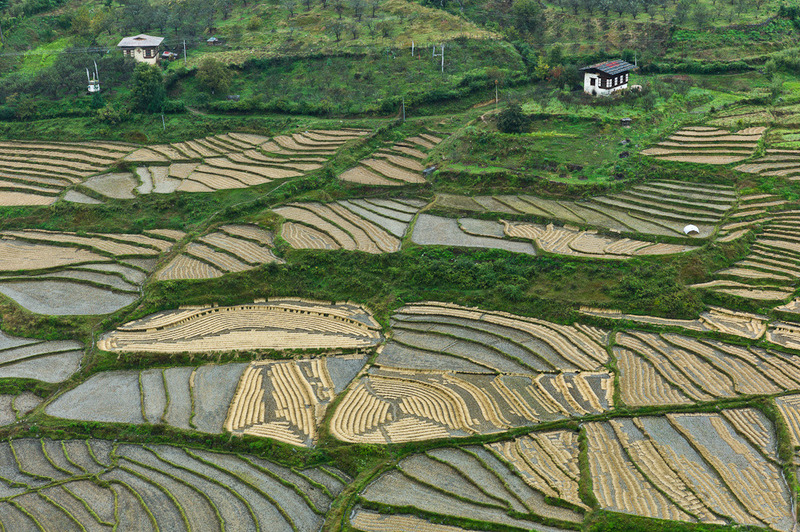 This entry was posted in Uncategorized and tagged Bhutan, Paro, rice field on October 22, 2010 by cranky. This entry was posted in Uncategorized and tagged Bhutan on October 21, 2010 by cranky.